If you regularly download files from internet you need a best download manager which can fasten downloading speeds and also give you option to resume the download so that you can download the files later in case of interruption in internet connection. I mostly use Internet Download Manager (IDM) but it is not available for free. So I’ve collected some free download managers that you can use to download files from internet. VDownloader is a powerful tool that can search, download and convert videos from Youtube, Google Video, Metacafe, MySpace, DailyMotion, Pornotube, Yuvutu, and many other similar sites, saving them in AVI or MPG format. It is also a powerful video converter. GetGo Download Manager is a FREEWARE Download Manager and Accelerator. It is easy-to-use, fast, powerful, and completely FREE. It is designed for new generation of web (2.0), GetGo can easily download video/music/file from YouTube, Myspace, Google Video, MetaCafe, DailyMotion, iFilm/Spike and any websites with embedded FLV flash videos. Download Accelerator Plus (DAP) is the worlds most popular download accelerator, giving you the fastest possible download speeds, with privacy, security, and ease of use. Free Download Manager is a powerful, easy-to-use and absolutely free download accelerator and manager. Moreover, FDM is 100% safe, open-source software distributed under GPL license. FDM accelerates downloads by splitting files into sections and then downloading them simultaneously. As a result download speed increases up to 600%, or even more! FDM can also resume broken downloads so you needn`t start downloading from the beginning after casual interruption. Download social video and music, accelerate, schedule, resume, recover, and manage Internet downloads. 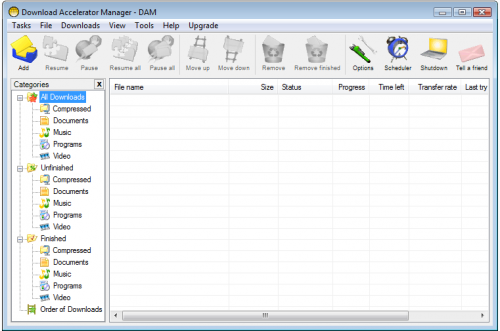 Download Accelerator Manager (DAM), an easy to use, micro-sized tool, is made for the Internet file and social media downloading, such as video, music, and more downloading, from rich media sites with all browsers. DAM makes downloads easier and faster. 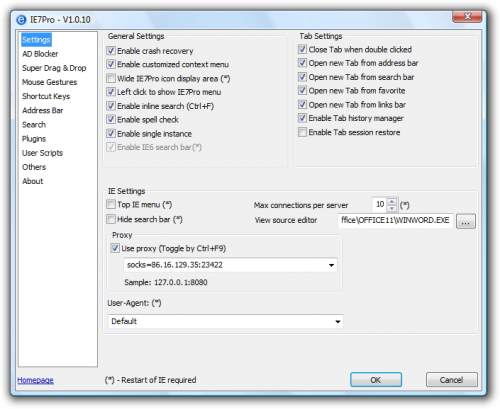 IE7Pro is a must have add-on for Internet Explorer, which includes a lot of features and tweaks to make your IE friendlier, more useful, secure and custmizable. JDownloader is a free download manager specially designed for free file hosts like Rapidshare, Mediafire, Megaupload etc. It requires Java Runtime Enviroment (jre/jdk) 1.5 or higher. It is supposed to download complete Web sites. You give it an URL, and down it goes on, happily downloading every linked URL in that site. While it goes, it changes the original pages, all the links get changed to relative links, so that you can surf the site in your hard disk without those pesky absolute links. Limited Ftp support, it will download the files but not recursively. LeechGet is a download manager that uses a very nice, modern, Microsoft Outlook-like user interface and seamlessly integrates into Internet Explorer, allowing you to easily start and manage your downloads. LeechGet provides many features, such a automatic downloading, resume of broken downloads, a download timer, automatic hang-up and shutdown and more. A built-in web parser lets you download complete website with all images and scripts in no time. KooLoader is an all-in-one download manager software that guarantees a worthy Internet downloading experience through the addition of an adaptive download accelerator, segmented downloads for acceleration, an astounding number of simultaneous downloads and more. Anytime you need to download something online, copying the URL of that file will prompt KooLoader to automatically paste it into its main window and simply hitting OK in the small window that will be displayed instantly, will start the download. I like Orbit and wellget. Will try out these for sure..
Orbit downloader is great, the next is Free Download Manager. Thanks for the list. .-= Phaoloo´s last blog ..Keep And Use Your Passwords Safe And Effectively Using KeyPass =-. for now, i’m in love with JDownloader. The beaut Download managers are Orbit Downloader (Free one) and Internet Download Manager (Paid). Orbit Downloader is best of all the FREE DOWNLOAD MANAGER’S. Although your prepared list is a GREAT JOB and impressive too. I use OPERA for browsing and Orbit for DOWNloading. HA! HAA!! HAAA!!! I dont recommend flashget,it allways gives a IE script error when ya press a button,eaven if ya dont have viruses adware malware etc or disabled these errors,I really dont like that,DONT…GET…IT!!!! Good list….. it will help my work to get a free wordpress or blogspot template. .-= Blogger Template Place´s last blog ..WhiteBox Blogger Template =-. FDM is the strongest , torrent supported , Html spider , site downloader , Uploder , and site manager ! full advanced setting ! firefox strong plugin , that you can insert 1000 download link in just 10 secs with extension remover ! any way it is the BEST ! IDM is the best download manager but its not free that’s why I didn’t mention it in this list. i have tried orbit downloader .It works very well..
Nice list, the mozilla add on is the best to me but these are worth a try. Thanks for sharing this Fantastic list! don’t try any one if your time is precious. nice post here. i use fdm and orbit they are ok.
but i will like to see speedbit download manager or is it not free. I this Orbit Downloader is the best of the lost. Superb speeds and reliable too. FlashGet seems to be a really highly used Download Manager. its ok but what about Internet Download Manager i am using it. it is working very good. Internet Download Manager is best download manager but its not freeware. Its paid software. Among the paid versions, Internet Download Manger is the best. Next comes, the free one, Jdownloader. It has many options, can check the online availibility and can parse the download link automatically. However it uses much system resources and is slightly slow than IDM. I had tried most of the download managers out there. So far Flashget and Orbit are the best ones for downloading files at amazing speeds. Both of them utilize maximum available bandwith provided by the ISP. FDM has been for a long time, it’s packed with lot of features and the user interface is little bit complicated for new users, but still good in downloading. JDownloader is good in downloading files from file sharing servers such as rapidshare, megaupload etc. In simple words, most of the paid download managers like IDM, DAP and others work like torrents. So, my advice would be to switch for a faster internet plan and use any download manager of your choice. Hope, you’ll find this useful. Pretty good list of free download managers and i personally like Orbit Download Manager as it has almost all we need. ya its not free but you can use patch to make it free. really its fastest downloader. I’m gonna give FlashGet a try. Let’s see! Anyways, thank you Mr. Simrandeep Singh! Download manager works well in downloading applications and programs. I am using it since i bought my laptop and satisfied a lot with the patch downloads with nice speed. There is nothing more frustrating than an interrupted download especially when its a heavy file and on 99.9% the download just freezes….Well i have been a big fan of IDM but am glad to know i have options. Thanks for the tips, i love your blog. I personally feel that Internet Download Manager is the Best one. Internet Download Manager (IDM) is just awesome. i have given it 5 stars. you can check it and get satisfied and kick off other downloaders. Which is the best and free ware as per your knowledge? I need extreme downloading with resume and pause. Also can i convert 2g to 3g or not?